While the king's away, the prince will play... and the people of Nottingham will have to pay. "P.J." wallows in gold-encrusted richness while his minions tax the poor right out of their homes. Their only hope is that meddling Robin Hood and his Merry Men of Sherwood Forest, who threaten to crash John's selfish little party for good. The treasonous mama's boy and his pals are eventually sentenced to hard labor in a penal rock quarry. Ratcliffe is the primary antagonist of the film and leads an expedition to Virginia to find gold and other riches (which he wants to keep for himself). Avarice is practically his middle name; all he wants is to find his own "gold of Cortez" just so he can prove himself in King James' court, and if slaughtering savages and pillaging their land is what has to be done, then he's willing to give it a go. Of course, he leaves all the heavy lifting to his underlings, all because of one crick in his spine. At the end of the film, having accidentally shot Captain John Smith, he is put in chains and shipped back to England in disgrace. In Robin Hood, Prince John raises the taxes and all who cannot pay are put in prison. At the movie review site, Rotten Tomatoes, Robin Hood has a 55% "rotten" rating among critics, saying that it was "One of the weaker Disney adaptations, Robin Hood is cute and colorful but lacks the majesty and excitement of the studio's earlier efforts." In regards to sin, greed is an inordinate desire to acquire or possess more than one needs or deserves, especially with respect to materical wealth. 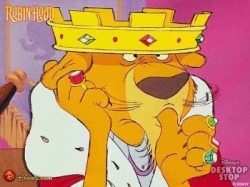 Prince John, as is shown in his clips, desires more wealth and power than he needs, as he is already a Prince and rich. It is this desire to obtain more wealth and power that brings about his downfall. At the end of the film, King Richard returns and pardons Robin and Little John, and forces Prince John, Hiss and the Sheriff to do hard labour. In Pocahontas, a ship carrying British settlers from the Virginia Company sails for North America in search of gold and other material riches. On board are Captain John Smith and Governor John Ratcliffe. A storm erupts, and Smith saves the life of an inexperienced young settler named Thomas when he falls overboard, befriending him in the process. In the "New World", Pocahontas, Chief Powhatan's daughter, learns that her father wants her to marry Kocoum, one of his finest warriors, but a bitter and serious man. Pocahontas does not want this marriage, and asks the advice from a talking tree spirit named Grandmother Willow. Grandmother Willow tells Pocahontas to listen to her heart. The British settlers land in Virginia and dig for gold under Ratcliffe's orders. John Smith explores the territory and encounters Pocahontas. The two spend time together, with Pocahontas teaching John to look at the world in a different way, and to not think of her people as "savages". Back at the settlement, the Powhatan warriors and Englishmen have a skirmish, and one of the warriors is injured. The warriors retreat, and Powhatan declares that the white men are dangerous and that no one should go near them. According to the article Pocahontas: The Symbolic Boundaries of Moral Order, the other men "were under the authority of Governor Ratcliffe but were inspired by the leadership of John Smith." Ratcliffe was calling the orders but John Smith was the man that the others respected. Ratcliffe`s greed and obsession with wealth leads to him shooting Smith and being dragged back to England as a prisoner.